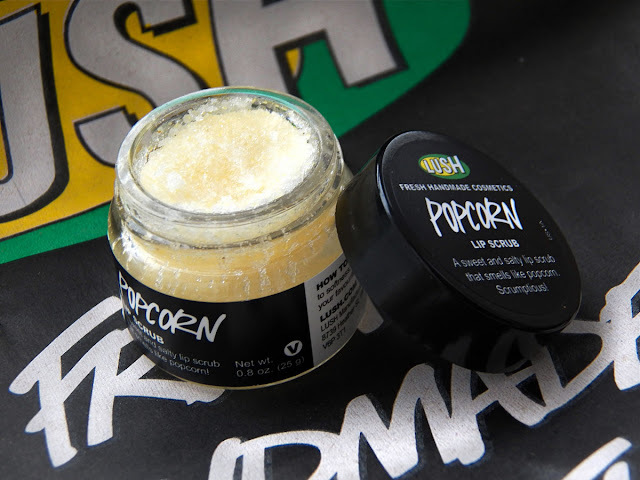 Popcorn Lip Scrub is an alternative to the other flavours of Lip Scrub from Lush. In any one store you might see - Bubblegum, Mint Julips and Sweet Lips Lip Scrubs. I have tried all three of those products and they are all brilliant, I'm just more of a fan of the Bubblegum one because it fits in with my favourite products from Lush in the Snow Fairy range. Like the other Lip Scrubs, Popcorn, is designed to keep your lips kissable, smooth, conditioned and dry, flaky skin free. So, whenever the weather changes so rapidly your skin can look dry and tired and sometimes you feel washed out and use a treatment or lotion to combat this making you feel much better and more confident, so why not do the exact same thing with your lips? When your lips are dry and chapped it can be quite painful to try and remove the dry skin and it can be quite difficult and before I spotted these type of products I had in the past used an old toothbrush to remove such skin from my lips, not that it was very easy to do or as successful as using something specially designed like this. Popcorn Lip Scrub comes packaged just like the other two products within this range and that is in a small round glass tub with a black lid which screws on and off the pot in a very easy motion. On the jar of this product are the words Popcorn on both the lid and surrounding label along with the most important two words which are lip and scrub. The pot itself is see-through behind the label and through the pot you can see a Creamy coloured sparkly looking scrub. Also on the lid of the tub is a brief blurb which says "Be a blockbuster success and have them queuing up for the sequel", yes well we will see wont we! It retails at £5.25 for a 25g jar which is the exact same price as the other products within this range and whilst it does sound expensive, I actually find the product really good value for money. My last tub lasted over a year and I used it at least once a week. Jojoba Oil can be used on all skin types but is especially used as a moisturising ingredient for dry, flaky skin. Sea Salt is also present and it helps to condition your lips and act as an exfoliating agent to remove dead skin cells and dry skin. Coconut Oil comes next and for me this is one of the main aromas, it is wonderful and more so for your skin because it helps moisturise the skin keeping it soft and smooth and it also help your lips from cracking and becoming chapped. Then comes a bit of a surprise ingredient with Popping Candy and you'll find once you have finished rubbing this across your lips there will be a tingling sensation which, whilst pleasant is a bit of an odd feeling. Unlike other Lush products this one doesn't come with a long list of other ingredients it's a simple product with a simple ingredient list. When it comes to using this Lip Scrub, it is exactly the same as I mentioned in my previous review, but got the benefit of those people who haven't read it yet. One of the first things you need to do is to remove any traces of products such as lip gloss, lip balm or lipstick which you might have applied and this is to ensure your lips are as bare as they can possibly be and as clean as they can be as well. Then I would suggest cleaning your lips using water and a relevant facial cloth before using this lip scrub, just to ensure your lips are clean and that there is no chance any bits of dirt are left clinging to them. Then as this lip scrub is quite thick in consistency and because it is to be used on your lips you don't actually need to be using too much at a time. Like with most lip balms you apply this directly onto your lips, but instead of running your finger along your lips to get that smooth look, you will need to rub it into the skin on lips in small circles to remove all of the dead skin cells and any other impurities from your lips and once you have worked your way across your lips, using some slightly damp cotton wool you gently remove the left over product from your lips and then using your finger check your lips to make sure you haven't missed anything, if you have simply copy the actions you have just done. Once you have finished, what you will notice what effect this product has had on your lips because you will see traces of what has been removed and if your lips are really chapped you might find they sting a bit if you have pressed too harshly with this scrub, because although it is castor sugar which acts as the exfoliating agent, it is quite harsh on the skin, particularly as the skin on your lips is quite sensitive compared to the skin on other body part, so take extra care the first time you use this product. Once I had finished scrubbing my lips my first initial reaction was to see how smooth my lips felt, so I ran my tongue along them. When my lips become dry it is always tends to be in the same place and that is right in the middle of my top and bottom lip and once I had used this product my lips felt soft and smooth all the way along. The after feel should be a soft and smooth one, what I noticed was no sign of any hard or loose skin but soft smooth lips and because it is a scrub you will need to use a lip balm afterwards to ensure you keep your lips moisturised. I have since continued to use this scrub once a week since buying it and even though it isn't my favourite Lip Scrub, I still really like it. There is a contrast between tasting sweet and salty as you rub it across your lips and the slight buttery taste you associate with popcorn is also evident, but the best part if knowing it contains popping candy and therefore at some point you are going to feel that tingling sensation. Overall I am very impressed with this Popcorn lip scrub, it was easy to use, it smelled lovely and it has a lovely smell and feel to it which is an added bonus and price wise, I don't actually think it is expensive because it lasts a very long time, the last pot I had lasted over a year and I only bought another one because there was nothing at all left in my pot. For me these products are worth every penny and I sincerely hope they are here to stay amongst the Lush products. This one sounds nice but I think I'd prefer the bubble gum one too! This sounds lush! ( no pun intended! Lol) I've never used a lip scrub but with the cold whether we have been having I've noticed that they are really dry, so might have to give this a go. And I'll def get the popcorn flavour over the others!